eBay announced new browsing modules for shoppers, leverage its structured data better and help users surface listings with savings, best-selling products, etc. The modules include “shop by brand” options and other ways to look at category pages without using keyword searches. A new “save on” module is populated with best-priced listings via an algorithm that leverages the structured data to instantly identify listings where the price is lower than trending prices. A “best selling” module surfaces relevant products rather than just listings. It can take a product category, such as digital cameras or guitars and surface the most popular models. The company says one goal of the modules is to better serve users coming to eBay from Google results. The new experience will provide these visitors with better guidance on products. The company says it has more browse module and search news in the pipeline for the coming months, so stay tuned for that. 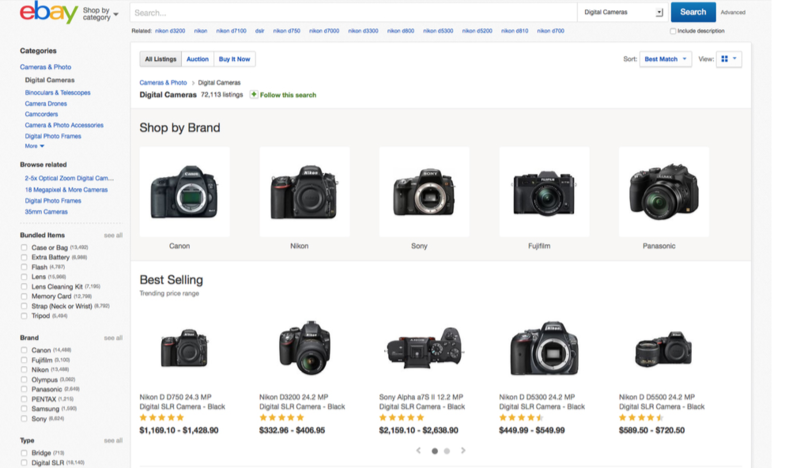 Earlier this week, eBay made improvements for users searching for product identifiers. Last week, it revealed its big Spring Seller Update, which has a lot of changes for sellers.